Recently, we've been thinking a lot about painting and the body. We discovered a bunch of old photos from the '60s, from back when Yorkville used to be cool. They were taken at The Penny Farthing, one of the coolest clubs in the 'hood, with a swimming pool on the roof and Joni Mitchell working as a waitress downstairs. In 1967, they had a "paint-in" — an event where a bunch of half-naked models had their bodies painted in a kaleidoscope of colour and dayglo text. Then, we were writing a bit about the French artist Yves Klein, who pained models blue and had them roll their bodies along a canvas in order to make his art. So, we're pretty interested in the Human Canvas Project, the latest from artist and author Matti McLean. He has painted the bodies of more than 100 models in an "ongoing process involving music, paint, and photography." According to the press release, the project "seeks to reconcile the relationships we have with our bodies." And it certainly seems to us like the images raise all sorts of interesting questions about body image and art and taboos and the ways in which we construct and project meaning. There's a party for the project tomorrow night, launching an exhibition of 100 portraits, along with an accompanying book. And just like the Penny Farthing and Yves Klein's studio in the '60s, there will be a live recreation of the painting process. It's at the Glad Day Bookshop, on Yonge north of Wellesley, at 8pm. And the show runs until November 10th. The Facebook event invite is here. 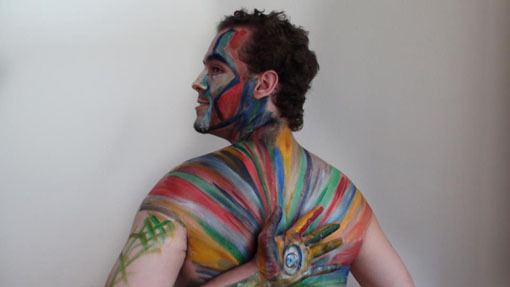 And you can also find more info by liking the Human Canvas Project here.